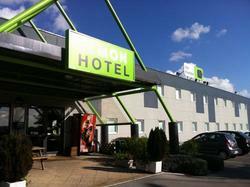 The Lemon Hotel Arques is situated a 5-minute drive from the town of Arques. It offers free Wi-Fi and free on-site parking. Rooms at The Lemon Hotel Arques are simply decorated and feature a flat-screen TV with satellite channels and a fridge. Rooms have a shared bathroom and toilet, which are located on the landing. A continental breakfast is served each morning at the hotel. Vending machines offering drinks are also at the disposal of guests. Saint Omer SNCF Train Station is a 5.4 km from the hotel. Merville Calonne Airport is 31 km from Lemon Hotel Arques and Batavia Lake is 2.5 km away. Guests arriving after 21:00 are kindly requested to call the hotel to obtain the access codes. Contact details can be found on the booking confirmation. Guests arriving after 21:00 will be required to pay at the reception the following morning. This room has a shared bathroom, which is located on the landing.